What’s new in FCPX 10.3? Apple just released the latest version of FCPX 10.3 and it’s a big one. All the editors and trainers who were under NDA can now bring us all up to date on the latest features in this huge update, that is once again free to all existing FCPX owners. You can download it today from the App Store, but if you’re an existing FCPX 10.2.3 editor you might want to scroll down to the tutorial on upgrading to FCPX 10.3 the smart way, before you do. You can also download the updated user manual which weighs in at a hefty 791 pages. Or read the slimmer release notes here. This slickly edited (would you expect less?!) video from Trim editor Thomas Grove Carter, showcases his top 10 features in 10.3. It’s a fun watch and will get you up to speed on the feature highlights in under two minutes. Thomas is also showcased on the Apple site as part of it’s latest ‘in-action’ article, which is well worth a read. If you’ve not previously seen Thomas’ brilliant presentation from the Soho Editor’s booth at BVE 2016 then you’re missing out on a real treat. This is especially good for editors coming from other NLE’s and workflows to see how easy it is to get creative work done quicker in FCPX. I previously included this video in my fairly extensive round up on FCPX Advanced Workflows and Tutorials. UPDATE – Thomas also has a post over on HuffingtonPost.com which deliver’s his take on working with the new 15″ Macbook Pro and FCPX. A ‘Professional’ should be defined by the work they deliver and the value they bring, not their gear. Use the new MacBook Pro, don’t use the new MacBook Pro. Your audience don’t care. You just have to keep making great work however you can. For me, I love it and I think most people will do too… once they actually touch it. I’ve split out all of the new Macbook Pro related content that was in this post, into this new post. For probably the most detailed write up on FCPX 10.3, head over to trailer editor and FCPX champion Charlie Austin’s site fcpxpert.net. Charlie works’ his way through many of the new features and offer’s his perspective on how to make the most of them. It has the visual utility of traditional tracks, without losing any of the Magnetic Timelines’ utility. FCP X had already made traditional tracks seem obsolete, but now Roles and Lanes View make tracks feel positively archaic. You can flip through all these views in real time during playback of course… it’s really amazing what Apple have done here. Here’s a little animation that cycles through all the views, and reorders some Roles. It’s a really great post, packed with illustrative images and well worth taking the time to read through. Larry Jordan also has a good write up on the new features in FCPX 10.3 that’s really worth reading because of little insights like this, that come from an experienced editor and trainer. In the center of the screen, on a line about half the height of the old Toolbar, Final Cut displays the name of your project, the total duration of your project, AND (in yellow) the duration of any selected clip or clips. This is SO MUCH easier than selecting a clip and typing Control + D just to see a duration; though Control + D still works. Editor Marc Bach has posted a very thorough write up of his thoughts on the new features in FCPX 10.3. It’s a great post and has some really useful insights not found in other articles and tutorials. We can send the timeline to the secondary screen to have it take the whole screen or we can hide the browser and leave timeline and viewer on each monitor to focus on effects or color correction. It’s well worth a read as Marc is a seriously experienced FCPX editor who cuts numerous broadcast TV shows in FCPX every day. Scroll down to the bottom of this post for a host of tips from Marc, in the Twitter tips section! In this fairly epic post from editor and PVC blogger Scott Simmons you can learn a lot about the new updates in FCPX, what wasn’t updated and how to navigate some of the new features, especially if you’re encountering them for the first time. At the same time that Apple released the new version of FCPX 10.3, they also released a set of brand new Macbook Pro laptops, starting at $1,799/£1,899 and going all the way up to over $4,299/£4,000 if you fully spec’d one out. When I originally wrote this post I had a whole bunch of links and reviews on the new Macbook Pro and FCPX but I’ve split them out into this new post. Check it out here, for a lot more details and opinions on whether Apple’s new laptops are suitable for video editing. UDPATE – Breaking down what can the Touch Bar actually do? FCP.co has a fantastically detailed article on just what the Touch Bar can do, and how it works inside of FCPX thanks to freelance editor Chris Roberts. Chris provides screenshots of pretty much every single available Touch Bar interface inside of FCPX and in some of the System commands too. It’s the first I’ve seen online of such an in-depth look at what the Touch Bar can do and so well worth a read! So is the Touch Bar a gimmick or the future? In my case at least, the Touch Bar itself doesn’t add anything to my workflow. That said, the more I’ve been using the new MacBook Pro (for writing this article in Pages for instance), the more I find myself tapping the options that magically appear in the Touch Bar, so even now I find myself adapting to its potential. Mark and Steve from Ripple Training are doing us all a massive favour by releasing not one, but two sets of free video tutorial series on FCPX 10.3! In this first playlist of 10 short tutorials you can get a closer look at many of the new features and improvements including the new user interface, updated Timeline 2.0, the brilliant new functionality that using Roles provides and much more. At just under an hour of free training content this is fantastic way to learn how to make the most of the new features and improvements. 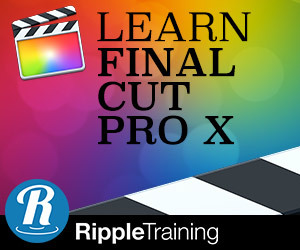 If you’re looking for something even more in-depth Ripple Training have also released a 6 hour training title called Final Cut Pro 10.3 Core Training. This new training series will teach you everything you need to know to edit competently and efficiently in FCPX and also includes follow along training materials to help you learn by doing, not just watching. Click on ‘Tutorials Outline’ tab on the Final Cut Pro 10.3 Core Training page to see what the course covers in it’s 38 chapters! It’s a pretty exhaustive list. In this part of the series Mark and Steve take a detailed tour of the updates to the FCPX Timeline 2.0, which is where the majority of the workflow changes have taken place. The last video in the series takes you through the free upgrade process with some important advice on archiving your existing copy of FCPX 10.2. Mark also suggests the best way to archive your existing 10.2.3 projects. A crucial watch if you want to protect yourself from any potential problems down the line! In the second set of free training from the Ripple Training boys you can get started in FCPX 10.3 in under 30 minutes. This is aimed at absolute beginners, so if the new functionality has whetted your appetite for giving FCPX a go, then this will be a solid place to start. In the introduction to the first tutorial Steve mentions a free project file and video clips to use to follow along as you learn.. Although the link doesn’t seem to be in the Youtube description just yet, but it’s great that they are making it as easy as possible for you to learn FCPX for the first time. Filmmaker Izzy Hyman has released a new free tutorial course for FCPX 10.3. 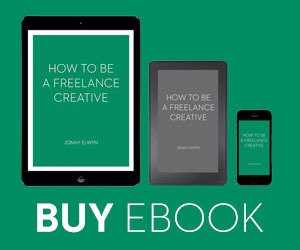 You can purchase the course to download all of the tutorials and the follow-along media or you can enrol for free here. It runs at close to three hours, and covers everything from the new user interface to trimming, working with effects, exporting and more, which is pretty great value for free! Izzy’s original course was part of my Beginner’s Guide to Learning FCPX post which you can check out here. One of the biggest things that has changed in FCPX 10.3 is the audio roles and lanes functionality. In this more recent deep dive tutorial from Mark and Steve you can understand just how the audio signal flows through your clip and timeline. This is a must-watch for any editors who really want to get their head around the nitty-gritty. Charlie Austin has posted a follow up post (to this original post) which focuses in a lot more detail on the new Roles functionality. It’s a really in-depth post with a lot more detail for those who want to go ‘deep’! Those of you who’ve updated to FCPX 10.3 (do it now!) know that Roles have taken on even more importance than they already had. You can now use them — via new controls in the timeline index — to visually organize your timeline. Of course they also function in their traditional uh, role… routing audio for share/export. In this helpful tweet Charlie also breaks down some of the new Clip Badges in FCPX 10.3, which includes in mixed audio and audio effects. In this image Charlie has laid out a diagram attempting to display visually what Audio Roles might look like if they were a fully fledged Mixer. Luma Forge’s Sam Mestman demonstrates some new techniques for advanced mixing with Roles in FCPX 10.3. Mark Spencer offers a little more details on this in this Pro Video Coalition post. When it comes to applying effects to your audio, sometimes you want to apply one to a single component of a single clip, or all components of a clip; sometimes to all the audio within a specific subrole, and sometimes to all the audio in a overall role group. Final Cut Pro lets you do each of these, and lets you easily move back and forth between each of these levels to make additional tweaks at the clip/component level, the subrole level, and the role level. Editor and writer Oliver Peter’s has shared his thoughts on FCPX 10.3 in this new article. What was particularly interesting to me where his insights on some of the limitations of the new audio roles. 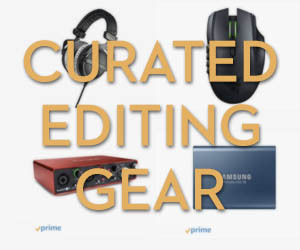 The following quote comes off the back of a description of creating an compound clip of your final project so that you can then have a single submix of each audio role to work with. Unfortunately, if you have to go back and make adjustments to an individual clip, you’ll have to open up the compound clip in its own timeline. When you do that, you lose the context of the other clips. For example, tweaking a sound effect clip inside its compound clip, means that you would only hear the other surrounding effect clips, without dialogue and music or seeing the video. In addition, you won’t hear the result of filters or volume changes made at the top level of that compound clip. Nevertheless, it’s not as complex as it sounds and this is a viable solution, given the design approach Apple engineers have taken. The whole article is well worth a read, as is the rest of Peter’s excellent site. If you’d like to read your way through all the new features in FCPX 10.3, and don’t fancy trawling through the updated User Manual, then thanks to ‘In The Socks of FCPX’ you can buy a 65 page user guide for just $7. The image above gives you a good sense of what you’re in for, with an illustrated explanation of each new feature plus some workflow tips thrown in for good measure! Check it out and buy it here. To watch the latest two hour live stream of the FCPX Virtual User Group watch the video above with the meat of the show beginning at about 6 minutes in. The best place to watch the show though is on Hazu, because you can jump to specific points in the show based on the questions asked and the tips delivered. Use the coloured timeline at the bottom of the Hazu page to jump through the show. 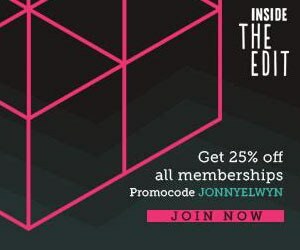 If you want to learn from some of the best FCPX professionals in the industry then this is the show for you! To watch previous episodes of the show jump over to this post on Professional FCPX Film and TV Workflows. FCPX editor and plugin developer Alex Golner has tweeted out some useful tips and links, which I’ve gathered together here. As always be sure to click on the date stamp to jump to the full conversation to see any replies and comments. UPDATE – I’ve updated this list with even more great FCPX 10.3 tweeted tips from many other editors too. When you reset preferences #FCPX 10.3 actually makes a very convenient Backup on the desktop. Lanes are NOT tracks. There’s no patching and they show up under request. #FCPX continues to have the magnetic timeline, it’s best feature. C selects the primary storyline clip under the playhead (or skimmer). 10.3 Roles Editor; Drag a custom subrole by the handle on ride side, over another sub/role, drop, it merges, those clips adopt new role. 10.3 New Behavior; audio clip, select a range, Delete mutes, Shift-Delete leaves gap clip, Option-Command-Delete deletes the range totally. Audio & Photo Browsers; select content, drag left, Library Browser appears, drop it into an Event. Just upgraded to High Sierra. FCP sadly greyed out. Anyway to still work with that program? Or is officially done.